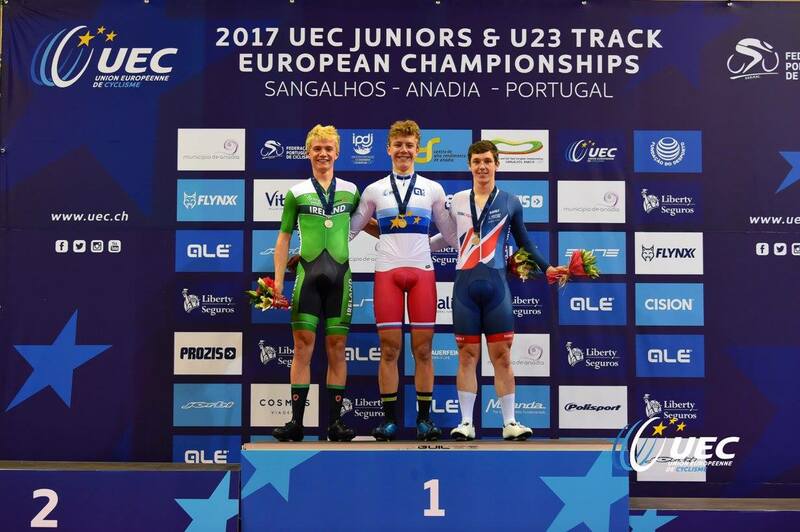 Irish cycling gets another Euro Champs medal thanks to Xeno Young in Portugal. Irish cycling has gotten another boost with news Xeno Young has taken a silver medal at the European Track Championships. He was runner-up in the junior individual pursuit having gone up against a Russian in yesterday evening’s gold medal ride-off. Ivan Smirnov (Russia) had been quickest in qualifying; posting a time of 3.16.462. Young was next fastest with a time of 3.19.063; a new Irish junior record. That meant they went into a head to head later in the day to decide gold and silver. And it was the Russian who came out on top in Anadia, Portugal. Young finished 4th in the event at these championships as a first-year junior last year. It meant was tying up some unfinished business by getting onto the podium. The Co Down teenager was doubling Ireland’s medal tally, adding to the silver won JB Murphy in the junior elimination race on Wednesday. “I gave it everything,” said rower turned cyclist Young after his medal ride. “Going into it I knew that if I raced my usual pace he would be faster, so I just went for it. “The last few laps were brutal. In that race, I did my slowest and fastest lap,” he said. “Last year I didn’t know what to expect before the race, so it was completely different this year,” he said. “I knew I was fast, so it was a lot easier this year. But I still felt like I had a lot of pressure, having come so close. “I’m really happy with how I went in the qualifiers, I paced it well. In the same race, Ireland’s Luke Smith finished 14th with a time of 3.27.255. Limerick’s Autumn Collins was also in action yesterday, in the U23 sprint. Showing some great promise and class, her 12.323 in the 200 metre qualifying distance was good enough to progress. It put her into an elite group in Europe; securing a place in the match sprints at the Europeans. There she came up against German Pauline Grabosch who knocked her out. Collins ended the event in 16th place. Today, Friday, sees Xeno Young ride the junior omnium. Mark Downey goes in the U23 points race, in which he took silver last year. Nicole Gorry will ride the junior omnium today; four races combining for an overall score. The UEC Junior and U23 Track European Championships are taking place in the Sangalhos Velodrome until Sunday.